I love fashion and of course like so many women I’ve often dreamed of having a walk-in wardrobe. A room that is filled with racks of clothes and shoes and accessories, but like so many women this will only ever be a dream. Like so many women I’m stuck with a regular sized wardrobe and having to decide each day what I’m going to wear. Often I look at my wardrobe and think I’ve got nothing to wear. Well, the real problem is that I’ve probably got too many clothes. As a result of this, I decided to weed out items that I didn’t like or know I wouldn’t wear. I found this to be extremely liberating. But you shouldn’t only do it with your clothes and shoes. It is a good idea to go through your jewelry as well. It is best that you stick with pieces of jewelry that prove to be more versatile. Nothing is more versatile than pearls. Not only do they go well with a variety of different outfits they also never go out of style. So hopefully the advice provided below will show you some of the stylish ways to incorporate pearls into your wardrobe. As you know pearls are renowned for being able to add a touch of elegance to your outfit. Unfortunately, they’ve also garnered a reputation for being a little traditional and the kind of thing you’d see elderly women wearing. But things have certainly changed due to the wide variety of jewelry designs that include the use of pearls within them. In fact, it doesn’t matter how frumpy some women feel such jewelry is, they regularly appear on runways. This is why today I’m going to show you some of the cool ways that will enable you to incorporate pearls into your wardrobe on a daily basis. As well as adding a touch of elegance to your outfit, I’m going to show you ways to wear them that are hip and modern. You can incorporate pearls even when wearing a casual outfit simply by wearing a simple strand of pearls around your neck. These would look amazing teamed with your favourite pair of jeans and a simple white shirt. Make sure to leave the two top buttons of the shirt open so that people’s eyes get drawn to the curve of your neck. 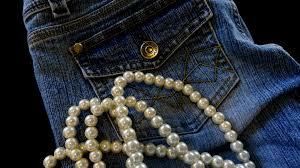 Another way to wear pearls is by buying a denim jacket or jumper that has some pearls sewn on to it. You could even save money by sticking some pearl studs on to a pair of jeans or jacket that you have. You can add a modern twist to a more traditional single strand of pearls by actually layering several pearl necklaces together of different lengths. This is some that the beautiful Jackie O loved to do. But you don’t need to just stick with several different pearl necklaces you can really mix things up. But make sure that the necklaces you choose are ones that will complement the pearls you want to wear. Of course, you don’t need to just do this with necklaces, you can also do the same with pearl bracelets as well. Wearing say two or three pearl bracelets with other materials and stones adds a lovely touch to even the most basic of outfits. You may be surprised to find that even the plainest of outfits look amazing when teamed with some beautiful pearls. If you’ve only just decided to start wearing pearls then you may want to keep things simple. Even smaller pieces can help you to make a statement and will add that touch of elegance to your outfit. For example, why not wear a small gold pearl ring. This is the perfect accessory to wear with say a more classic outfit such as a skirt and blouse. Such a piece will make you feel pretty even when you are at work. These days the wearing of pearls in your hair has become very fashionable. You could wear a hair clip or headband that includes some pearls in the design. For someone who is feeling a little more adventurous, you could up the stakes by wearing a crown. This is something that would look especially beautiful on a bride. You may also want to consider investing in a few pearl pins. These will add the perfect touch to any outfit and help to tie everything together. You don’t need to stick with just plain white, why not opt for coloured pearls instead. But make sure that you choose ones that will complement the colour of the outfit you are wearing. To incorporate such accessories into your everyday wardrobe is actually pretty easy. You just use them to pin back some stray hairs. In fact, the messy look seems to be quite chic at the moment. If you want to make a statement you can do this by wearing pearls with much bolder and brighter pieces of jewelry. Why not looking at teaming a beautiful pair of gold drop pearl earrings with a nice chunky costume necklace. Ideally, choose a necklace that is made up of a variety of different colours. If you want rather than wearing a conventional pair of pearl drop earrings, go for ones that contain baroque pearls. They come with their own unique shape and will provide a sophisticated but feminine look to any outfit. Plus they add a touch of vintage retro style to what you are wearing. There is one thing you need to remember. Only wear such with a simple fuss-free outfit. This will help to really bring out the conventional shape of the earrings even more. These are but 5 stylish ways to incorporate pearls into your wardrobe. But hopefully, it will help you to come up with some ideas of your own that will allow you to really bring out the beauty of such jewelry.